Published: July 27, 2012 at 10:05 a.m.
Steve Gleason was already a permanent part of New Orleans Saints history because of his blocked punt against the Atlanta Falcons in 2006. On Friday, the Saints will make it official. 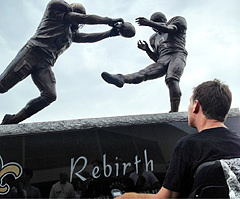 The team will unveil a statue of Gleason's famous play outside the Mercedes-Benz Superdome. Gleason says that statue is about more than just a moment in time. "I don't want this to be about me and that play," Gleason said. "I want it to be about what that play symbolized, which was a commitment by this community to rebuild. This statue is about coming through adversity. It's about finding your heroes. It's about commitment and a rebirth for all." The statue was commissioned by the Saints and will be called "Rebirth." Gleason suffers from amyotrophic lateral sclerosis (ALS) and continues to raise awareness of the disease through his foundation "Team Gleason." The statue will be a great reminder of all that Gleason is trying to accomplish, and the special place the 2006 Saints team will always have in the hearts of Saints fans. The entire Saints team is expected to attend a private ceremony unveiling the statue.